Recreational boat sales slipped in April for the third month in a row as the spring selling season continued to disappoint the industry. 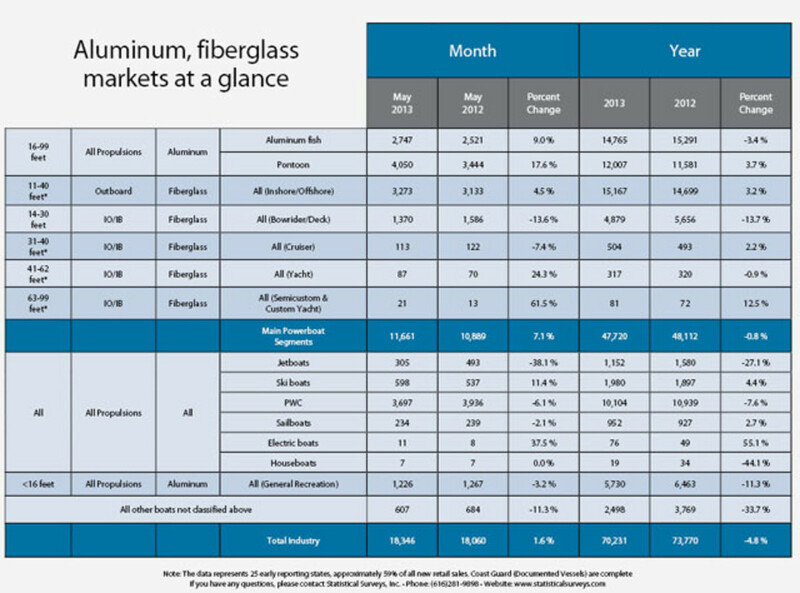 Even the aluminum pontoon category, a standout during the recovery that began last year, lost ground. Pontoon sales fell 3.6 percent to 2,522 boats from the same month a year earlier in 30 early reporting states that comprise 67 percent of the national market, according to figures compiled by Statistical Surveys Inc. Sales of aluminum fishing boats were up 3.8 percent to 3,365, helping to balance the decline among pontoons and typifying an up-and-down April pattern among the industry’s main powerboat segments, a group that consists of two aluminum and five fiberglass categories. Sales for the group were close to flat, falling 0.7 percent, or 70 boats, to 10,610. Industrywide, sales in the early-reporting states were 5.2 percent lower for the month at 15,824 boats. A year ago, with all 50 states reporting, sales totaled 26,130 in April, up from 22,415 in the same month in 2011. “There’s no way to sugarcoat [the April results],” said Ryan Kloppe, national marine sales manager at Statistical Surveys, noting the uneven category-to-category results. Builders blamed poor March sales on chilly, wet early spring weather and Kloppe agreed that April was still a cold month in the Midwest, but he said the weather was improving by the end of the month, leaving no easy answer for why sales continue to lag. Kloppe said he has spoken to dealers who told him they have made sales that haven’t been reported because the boats have yet to be delivered. “I’m eagerly expecting the [50-state] quarterly numbers to see whether we can even out [some of the inconsistencies],” he said. Those figures will be available by mid-June. With one month to go in the spring selling season, sales were down 3.9 percent for the year at 29,272 boats in the main segments and 8.1 percent industrywide at 42,710. Sales of 11- to 40-foot outboard fiberglass boats managed a slim gain of 40, or 1.2 percent, to 3,463 in April, but the 14- to 30-foot inboard and sterndrive category saw sales fall 12.6 percent to 1,044 boats. Sales in the bigger-boat categories were more encouraging. The 31- to 40-foot cruiser segment was up 11 boats to 116 and sales of 63- to 99-foot custom and semicustom yachts were up four at 25. Sales of 41- to 62-foot yachts lagged, falling by five boats, to 75. Sales figures in those three categories were complete for the early reporting states as the Coast Guard continued to stay up to date in its reports on sales of documented vessels. Sales of jetboats fell 19.2 percent to 286 and sales of personal watercraft dropped 18 percent to 2,167, but the ski-boat segment showed growth. April sales rose by 4.5 percent, or 20 boats, to 468. Sailboat sales rose for the second month in a row, climbing by 39, or 18.6 percent, to 249.